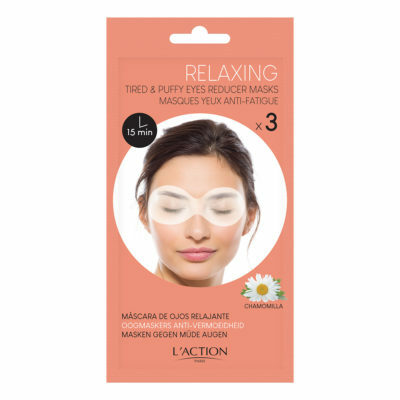 The combined action of decongesting chamomile, soothing aloe vera and anti-aging green tea revitalizes the eyes and soothes the eye contour area in a matter of minutes. Practical and fast acting, it is ideal for relaxation after a long day’s work, or the morning after a night out. AQUA (WATER), GLYCERIN, BETAINE, POLYGLYCERYL- 4 CAPRATE, PHENOXYETHANOL, ALOE BARBADENSIS LEAF EXTRACT, BUTYLENE GLYCOL, PROPYLENE GLYCOL, ANTHEMIS NOBILIS (CHAMOMILE) FLOWER EXTRACT, TOCOPHERYL ACETATE, ZANTHOXYLUM PIPERITUM FRUIT EXTRACT, PARFUM (FRAGRANCE), LONICERA JAPONICA (HONEYSUCKLE) FLOWER EXTRACT, CITRUS PARADISI (GRAPEFRUIT) FRUIT EXTRACT, ARGININE, CAMELLIA SINENSIS LEAF EXTRACT, LINALOOL, CITRONELLOL. Remove a mask using tweezers and then apply to eyes on clean, dry skin. Leave for 15 minutes before gently peeling off. Firmly reseal the sachet after opening. For extra freshness, put the sachet in the refrigerator half an hour before application. Avoid contact with the eyes.